MAC address or Media Access Control address of a computer is a unique identifier assigned to the network interface for communication. MAC addresses are used as network access for IEEE802 network technologies (like WiFi, LAN). In simple words, MAC address is the unique address to identify the network connection (which in use to access the medium). You can change it by using some of the Free Mac Address Changer Tool. To find the MAC of your PC network connections, follow the given steps. To go to the command line, press the keys (Win + R). In the box type in “cmd” and tap the “Enter” key. Then in the new window enter the following command- “ipconfig/all” and hit enter. You will now see all the MAC (or physical) address of all the network ports present in the computer system. Now, this MAC addresses are in use for various reasons. 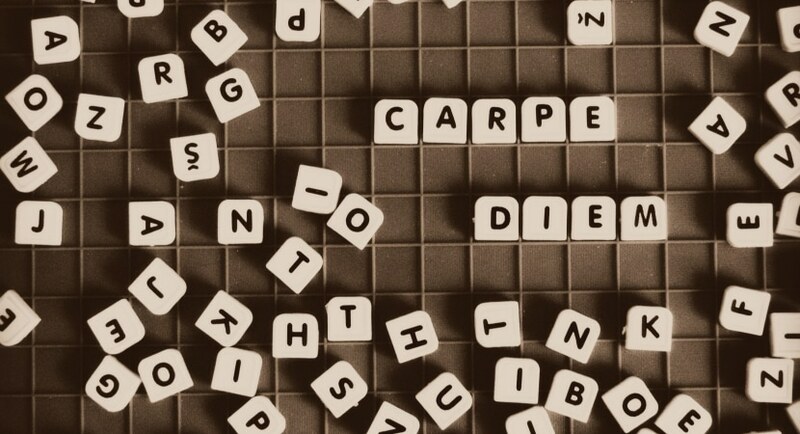 And, many of want to change it, but there are certain restrictions. So, we use additional tools to change, alter or mask these addresses. You can simply change the MAC address of the computer system through the control panel. But, there are free and simple tools to look after it. So, make full use of the below mentioned listed software to change the MAC address of the system. 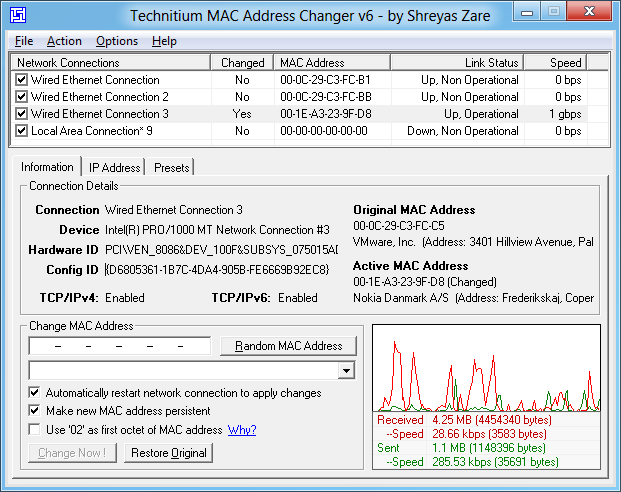 Technitium MAC Address Changer is one of the best MAC Address Changers in the market. This software lets the users change or mask MAC Address of the system in no time. 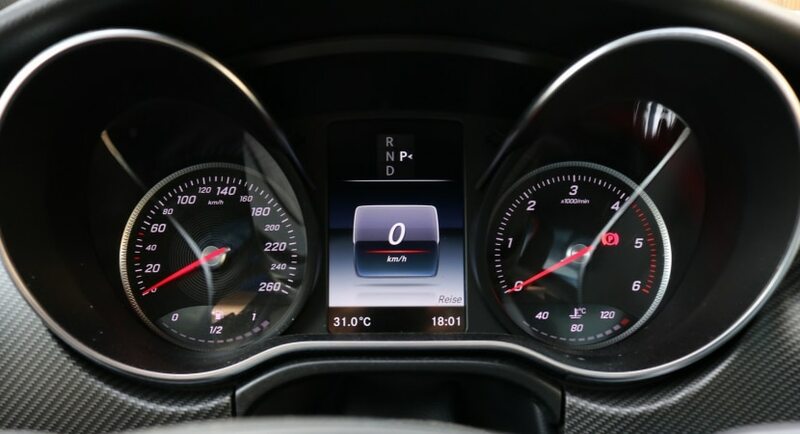 The user interface is simple, and the indicators are perfect in indicating the speed, status of each of the network connection. The software allows users the opportunity to change multiple properties of the network adaptor. Each of the detailed properties and MAC Address status of the network is displayed perfectly in the software. The software allows complete configuration of NIC. The software provides the best MAC Address changes and great additional features. Use the “Random Mac” to change the MAC to any random one. Users can also restore the MAC to the original one. The software is free of cost and is compatible with all windows systems. SMAC MAC Address Changer is another great MAC Address changer. The spoofing of IP configuration can be deleted with the help of this tool. Based upon the vendor of the software generates random new MAC Addresses. It looks up the MAC and displays it. The interface is very simple and very user-friendly. 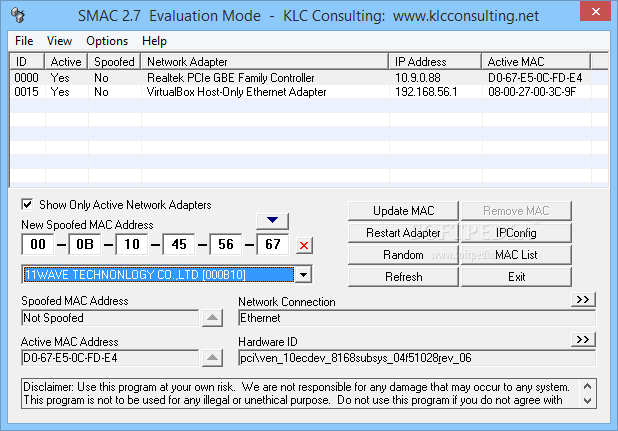 View the IP Configuration to detect the MAC address change. SMAC MAC Address Changer is available in many versions. The free version goes by the name of Evaluation Edition. It lacks many features but most basic and sufficient to use. 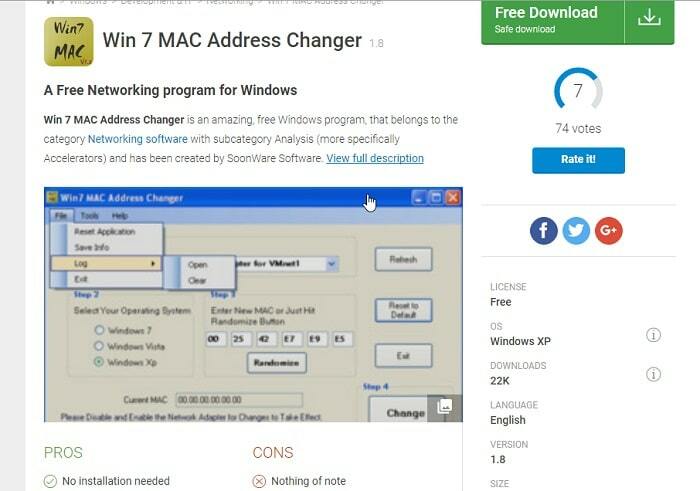 Win 7 MAC Address Changer is a good, and simple MAC Address changer. The interface is simple and displays only the information need. It works on both 32-bit and a 64-bit system. This software supports almost all the wired and/wireless NIC devices. It is very useful in troubleshooting and keeping track of network status. The software has “Restore” button to restore the MAC in a single click. The software keeps a log of all the activities in the network. The only drawback of the system is that it does not support on Win 10. It is the most compact tool available. NoVirusThanks MAC Address Changer is a simple MAC Address changer. The software easily finds out all the NIC present in the system. You can even activate one of the virtual adaptors if you need, from this tool. The software displays current MAC Address, vendor details, Network connection type, status, and Address type. This tool comes in a very tiny package. It is compatible with all NICs. No additional MS.NET Framework is required. Compatible with all windows versions. The MAC Address change can be done easily. 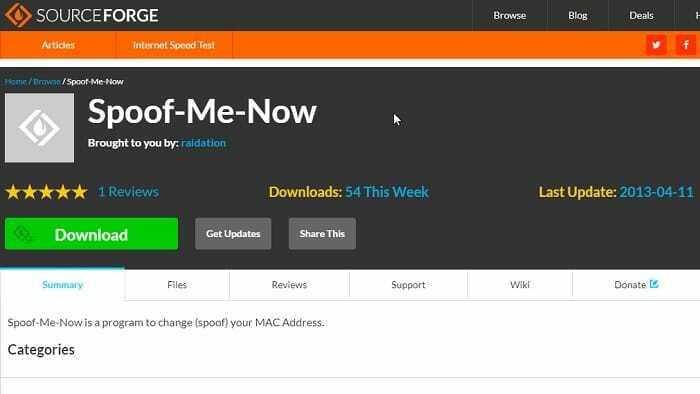 One of the simplest MAC Address changers, Spoof-Me-Now is a great tool. The tool has a simple interference. The tool is a clean software and is portable. Which means, the tool needs not to be installed in any system. Download the tool and use it in multiple devices. There remains no track of the software after the MAC Address change. This Free Mac Address Changer Tool contains a single window with all the feature presented there. The tool automatically generates and changes the MAC Addresses according to the NIC (and the manufacturer). It is compatible with all Windows devices. The tool does not provide many MAC changing the choice. Smart MAC Address Changer or Smart DNS Changer is a fabulous multi-utility software. The tool besides able to change MAC address also can change the DNS setting of the NIC in the system. This software has a kid shield which gets activated once a child has logged into the system. The shield stops the network from opening any adult content. You can also use the Proxy changer to change the proxy address of the network. This is a DNS changer software basically which also helps in masking and changing the MAC Address. The tool is cooperative with all windows versions. MadMAC is the simplest tool available. The MAC Address changer has a moderate interface. Execute the exe, and a single window appears. Change the desired network and observe the status of the NIC. Every change should be made manually. Except the MAC Address changing, the tool does nothing at all. In case, you want to change MAC after each start; you can also do that, using the tool. The tool is harmonious with all windows versions. Change MAC Address is the last tool in the list of Free Mac Address Changer Tool. 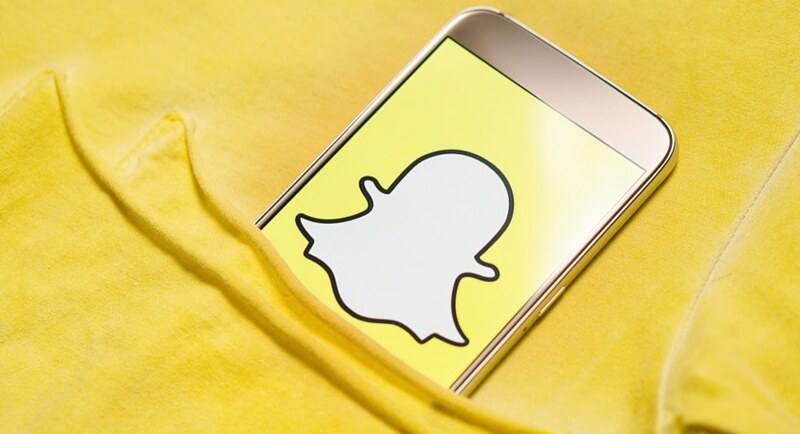 The tool easily finds out all the information about the network adapters, even those which are not accessible from privacy. This tool easily sets up the MAC Address of the vendor. Automatically enables the change in MAC after the modification. The change can be made even without affecting the vendor application using this tool. This tool supports all windows versions. Now, no need of finding steps for finding Free Mac Address Changer Tool on Google. Simply download any of the above tools and let them do your work. Easily change MAC Address with a few clicks. The list is completely suggestive, and any addition is welcome.